Today’s system development processes are complex and distributed. Many different software tools are involved and typically many persons playing different roles take part in an active or passive position. The key problems faced are the lack of consistency of artifacts produced during the development process, the lack of automation, and the lack of interoperability between tools. 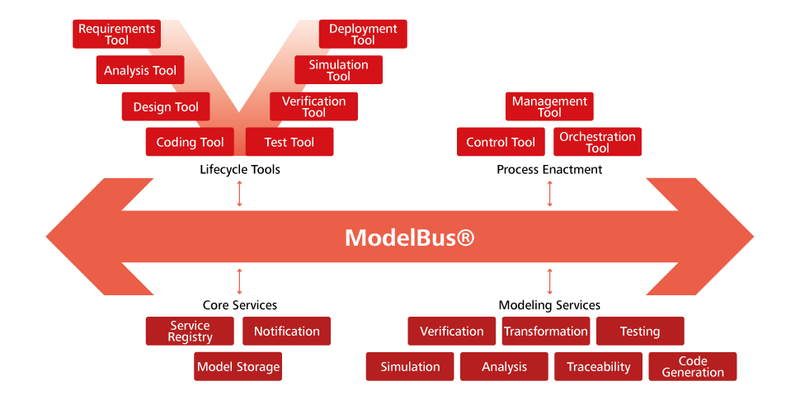 ModelBus® is a tool integration framework which is used to couple software tools used for software and system engineering. ModelBus® bridges the gap between proprietary data formats and programming interfaces. ModelBus® automates the execution of tedious and error prone development tasks such as consistency checking across the whole development lifecycle. ModelBus® uses SOA and ESB principles and tools are connected to the Bus by provision of ModelBus adapters. ModelBus® is an Open Source initiative. Code and document generation: MOFscript, M2T etc.